Cypress wetland, showing the distinctive ‘cypress knees’ – an adaptation to water-saturated and oxygen-deprived soil. Photo by Art Anderson. 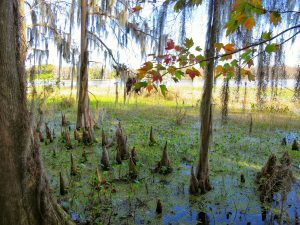 Some wetlands won’t stay wet, according to new research that blends long-term observations and climate projections. “By end of the 21st century, all five of the wetland sites we studied are predicted to become much drier,” says USDA Forest Service research hydrologist Ge Sun. A Carolina bay depressional forested wetland in South Carolina. Carolina bays are always oval, and the tips of the oval always point to the northwest and southeast. Their origins are a mystery. Two lower coastal plain wetlands in North Carolina, an undisturbed bottomland hardwood wetland in the Alligator River National Wildlife Refuge and a pocosin that has been drained and replaced with a loblolly pine plantation. Two sites in the pine flatwoods of Florida, a cypress pond wetland and an upland site dominated by slash pine plantation forests. Since the 1990s, Sun and his colleagues have collected hydrologic data from each site. The long-term hydrological datasets are extremely valuable, and the team used them, along with meteorological data, for the current study. Sun is from China and has maintained scholarly ties there, contributing to joint research projects and mentoring students. For this study, he worked with Jie Zhu, a visiting scholar from Beijing. Zhu led the study, which was published in the journal Hydrology and Earth System Sciences. The research team included scientists from the SRS Eastern Threat Center, Duke University, University of Illinois at Urbana-Champaign, NC State University, and Beijing Normal University. The scientists built five empirical models, one for each site. Once the models were developed, the scientists put them to work. They used the empirical models, along with climate projections from 20 general circulation models, to peer into the future. By 2100, temperature is projected to rise by 2 to 10 degrees C. As temperatures rise, potential evapotranspiration will also increase. In addition, precipitation patterns are changing. The changes would cause water availability to decline, and the depth of the water table would shrink. In some of the wetlands, the water table could retreat by more than eight inches. Water tables in other areas could experience only minor changes. But even small changes in the depth of the water table – just four inches or less – may have profound impacts on wetlands. Drier wetlands are more likely to burn. Exotic plants may also invade. The changes can cause chain reactions affecting many of the unique functions of wetlands. Some types of wetlands – such as the Florida pine flatwoods sites – may dry up. 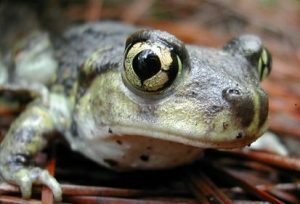 They’ll be missed, especially by the frogs and toads that use them as breeding sites. Photo by the National Park Service. The pine flatwoods sites in hot and humid Florida are most vulnerable of the study sites. Receding water tables are just one more way that wetlands can be lost. Wetlands are often lost to agriculture or urbanization. Indeed, one of the study wetlands – the pocosin in NC – has been replaced by a pine plantation. In the U.S. and across the globe, loss of wetland area is predicted to continue.